CLONING, CHIMERAS, AND THE BRAVE NEW WORLD – Pro Life Legal Defense Fund, Inc. 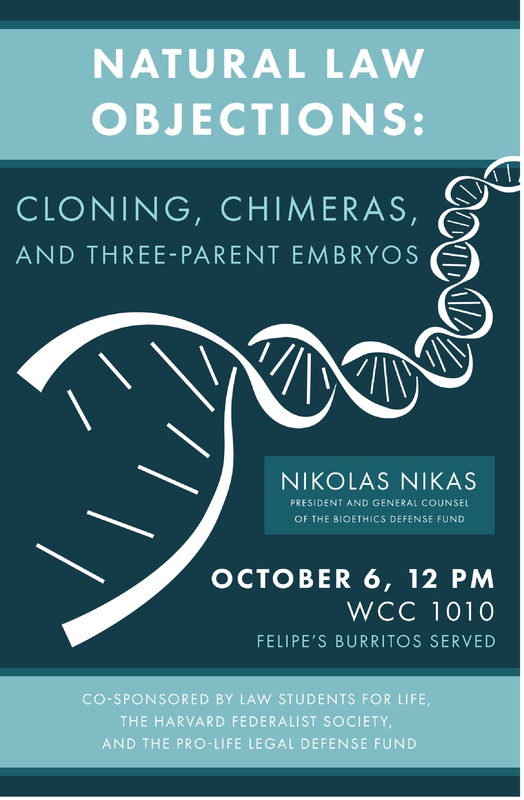 In 2016, PLLDF provided several opportunities for lawyers, law students, undergraduates, and the general pubic to hear Bioethics Defense Fund (BDF) Co-Founder and President, Attorney Nikolas Nikas, deliver enlightening presentations related to the origins of life and the end of life. One presentation was titled “Natural Law: Cloning, Chimeras, Animal-Human Hybrids, 3-Parent Embryos: What Every Lawyer and Law Student Should Know About the Brave New World”. The second presentation was titled “”Dying with True Dignity: What Every Catholic Should Know about Making Moral Decisions at the End of Life”. BDF is a prominent, pro-life public-interest legal and educational organization that has opposed threats to life throughout the United States and abroad for over 20 years. BDF’s presentations were made at Harvard Law School, Boston College, The Pastoral Center, and St. Theresa of Avila Parish in West Roxbury, MA. SEE NOTICES AND FLYERS BELOW.